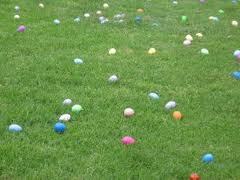 Every year the residents of Old Colorado City, Colorado celebrate the resurrection of Jesus with a community-wide Easter egg hunt. The children-only event, held at Bancroft Park, features hundreds of plastic Easter eggs filled with candy, toys, and coupons from local vendors. Due to the topography of the area and the average age of the participants, most of the eggs reside in plain view and are visually accessible without moving any objects. Traditionally, the parents stand behind the ropes separating the egg-hunt from the viewing area and all the children line up with their baskets. A master of ceremonies uses an air-horn to signal the commencement of the hunt and off the children go to the delight of all those in attendance. At least that was the way it was supposed to happen. Unfortunately, the young offspring of one of the spectators was not locating their plastic eggs efficiently enough prompting the parent to jump the barrier and start gathering with the child. Since there was no way in Hell the other parents were just going to sit idly by as Timmy’s guardian gave him a leg-up on the competition, they began jumping the barriers as well. Within seconds it was chaos and the entire event was halted out of safety concerns. Other than the obvious symbolism of birth and new beginnings, I was never clear on how an abnormally large mammal distributing eggs and confectionary products to minors tied in with the resurrection of Christ. Since rabbits do not lay eggs, aren’t we essentially celebrating kidnapping and undocumented adoption? I understand that tradition does not always bow to logic, but if I were to suggest a magical hedgehog handing out tadpoles as the new face of Lent I doubt it would garner much support. I have no issue with supportive parents, but perhaps we are placing too much emphasis on the Colorado City community Easter egg hunt when jumping a personnel barrier becomes a logical course of action rather than face the unfathomable horror of an egg-less child. I believe going home with an empty basket would be far less embarrassing that watching my dad single handedly shut down a local tradition because he thought me incapable of correctly gathering a plastic toy. Even Mrs. Rexford, who declined to take her child that year due to overbearing parents, seems to accept these actions as people wanting the best for their children. I was always under the impression that wanting the best for your child involved emotional stability and educational opportunities not honoring the risen Lord by smoking the Franklin boy in a demonstration of fine motor skills. I would hate to see how that parent would react if their child was passed over for the lead in a live nativity…. A new TV show - PARENTS GONE WILD !!!! !